As soon as the Seventh Trumpet sounds, the Church is removed from the Earth (Wheat and Tares). God then pours out the Seven Bowls of His Wrath upon the Nations (Pagans/Gentiles) of the Earth who will be “Left Behind”. The Seven Bowls of God’s wrath are the Third Woe and are part of the Seventh Trumpet. The Church is Raptured in the Twinkling of an Eye at the Last Trumpet. As soon as the Seventh Trumpet sounds, the Church is removed from the Earth (Wheat and Tares). God then pours out the Seven Bowls of His Wrath upon the Nations (Pagans/Gentiles) of the Earth who will be “Left Behind”. The Seven Bowls of God’s wrath are the Third Woe and are part of the Seventh Trumpet. The Bowls are for the Nations not the Church. 144000 Jews will be Sealed and protected from His Wrath. God wil separate the Nations into the Sheep and the Goats according to how they treated God’s People. Zechariah Ch14 tells us that there will be some Pagans who survive Armageddon and go on into the Millennium as the Nations on Earth (Millennial Nations). The pagans that survive Armageddon must be taken from among the Sheep Nations as the Goats will go to Hell. 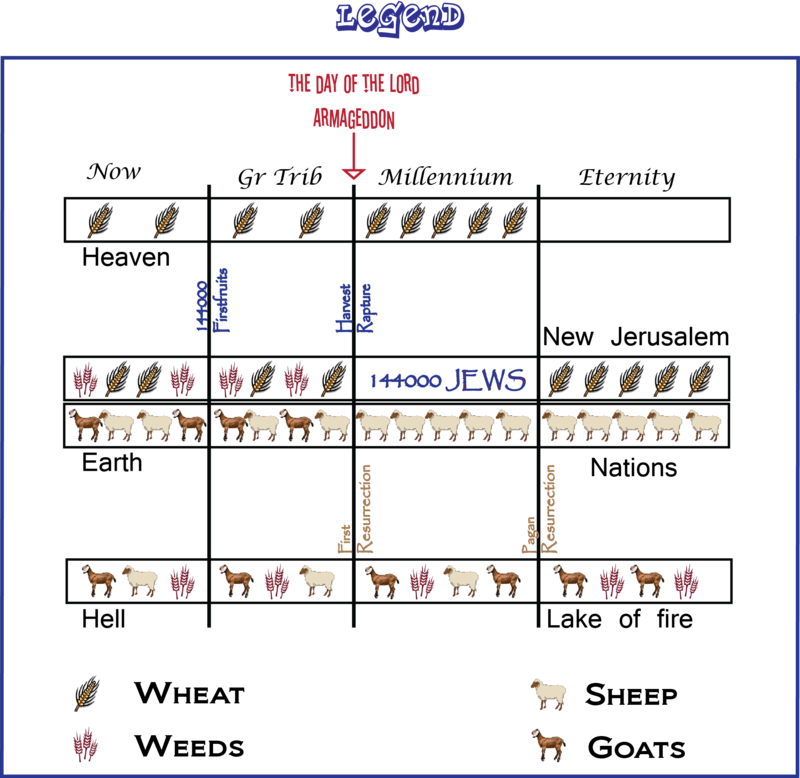 The Pagans who survive the Battle of Armageddon will accompany the 144000 Jews into the Millennium as a reward and to fulfill God’s Old Testament Prophesies to restore Israel. During the Millennium, the Church will reign with Christ in Heaven. 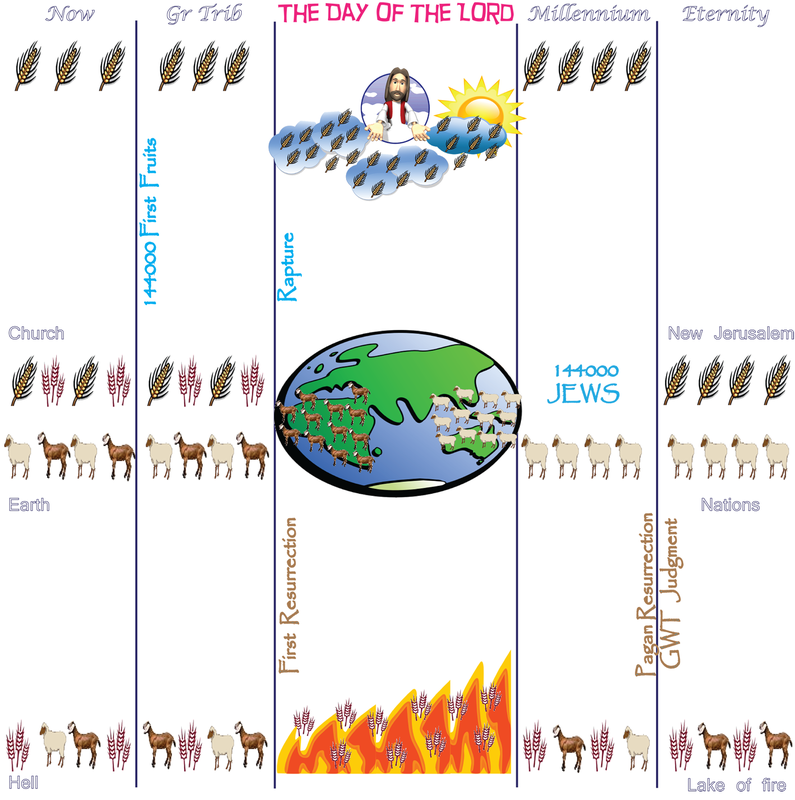 When the Millennium is over, The Bride will descend from Heaven to become the New Jerusalem on the Earth. Pagans will be resurrected and judged at the Great White Throne. Those whose names are in the Lamb’s Book of Life will become the Nations in Eternity. Those whose names are not in the Lamb’s Book of Life will be thrown into the Lake of Fire which is the Second Death.